What sets us apart from the other animals in the world besides our opposable thumbs? It's got to be our love for things of a frill-like nature. You know, like the fringe that is put on the sleeves of leather coats to make them look even more interesting, or the frilled edges of a ribbon on a birthday present which just seams to add that extra little bit of excitement to the whole package. Wouldn't it be great if you could add a little bit of that same style and flair to your motorcycle, too? Well, one of the things that I really enjoyed about the old classic Indian and BMW motorcycles was the little finishing touches that you noticed, the little things that gave those bikes that much more personality. One thing I always noticed was the leather fringe that was strapped to brake and clutch handles. 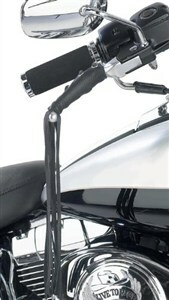 These Motorcycle Lever Covers, made by Hot Leathers, are a great example of that finishing touch you might add. They have 17 inches of fringe-flying fun and are made out of high quality, heavy-duty leather. The grommets are made out of stainless steel to ensure that there will be no premature ripping due to the wind. They come in pairs and are designed to fit any and all motorcycles out there.